a machine that is used to obtain lowtemperature refrigeration, mainly in the temperature range from 12° to 150°K, by means of the expansion of a compressed gas. A characteristic feature of gas refrigerators is that the working fluid, which may be helium, hydrogen, neon, nitrogen, or air, completes an entire refrigeration cycle while remaining in the gas phase. As a rule, a gas refrigerator is an ensemble of several units (Figure 1). The working fluid, which is compressed in a compressor, passes through a water or air cooler, where the heat of compression is removed. Then, after preliminary cooling in a regenerative heat exchanger, the working fluid enters an expander. The cold gas obtained after expansion cools an object in a refrigerated compartment and then either is returned through the regenerative heat exchanger to the compressor to be compressed again (in the case of a closed cycle) or is vented into the atmosphere (in the case of an open cycle). The type of expander depends on the method chosen to expand the compressed gas. work. The cycle based on throttling is the simplest but is not very efficient. Therefore, it is used only for the very small gas refrigerators known as microcoolers. Owing to their high efficiency, gas refrigerators with expansion valves are the most widely used. They include the gas refrigerators manufactured by Philips, which are usually single units consisting of a compressor, a regenerative heat exchanger, and an expansion valve. Gas refrigerators with expansion valves operate on the reverse Stirling cycle, which includes two isothermal processes and two isochoric processes. The theoretical efficiency of the reverse Stirling cycle is equivalent to that of the Carnot cycle. The refrigerating capacity of gas refrigerators with expansion valves ranges from several watts (at 12°–15°K) to tens of kilowatts (at 77°K). 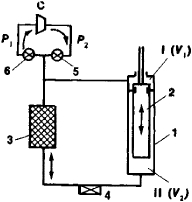 In addition to refrigeration cycles that entail the use of an expansion valve, the heat-pump cycle proposed in 1959 by Gifford and McMahon is also employed in low-capacity gas refrigerators. In this cycle, cooling is accomplished during expansion without the performance of external work. The main component of a gas refrigerator based on the Gifford-McMahon design (Figure 2) is a plastic piston that moves in a thin-walled cylinder containing two volumes v1 (hot) and V2 (cold), which are connected through a highly efficient regenerator with a checkerwork consisting of a thin metallic screen. The gas pressure is practically the same in the two volumes, and no work is performed when the piston moves. When Vl = 0, the system begins to fill with compressed gas. When the piston moves upward, the incoming gas is cooled in the regenerator, expands, and is cooled in volume V2, thus removing heat from the object to be cooled. When the piston moves downward, the gas is heated in the regenerator and leaves the system at a temperature that is higher than the temperature of the gas drawn from the compressor. The difference in the enthalpies of the incoming and outgoing gas flows determines the refrigerating capacity of the cycle. The energy removed from the object to be cooled is transferred to the environment as heat. The efficiency of this cycle is lower than that of cycles that entail the use of an expansion valve. However, gas refrigerators that operate on this cycle are compact, are simple in design, and may be readily constructed as multistage systems. Such systems make it possible to obtain very low temperatures, for example, 80°–100°K in a single stage and 14°–20°K in three stages. Gas refrigerators are used to cool, for example, radiation detectors and quantum mechanical amplifiers (masers) as well as to liquefy gases. Arkharov, A. M. Nizkotemperaturnye gazovye mashiny. Moscow, 1969. Tekhnika nizkikh temperatur. Moscow, 1975. The kitchen has a stainless steel refrigerator, gas stove, newer counter tops and back splash. tted in limed oak with contrasting work surfaces and AEG integrated dishwasher, integrated refrigerator, gas hob and breakfast bar with tiled surround. Surrounded by incredible native gardens and under the gaze of a curious kookaburra, I set up camp adjacent to the 'campers' kitchen', which I discover comes complete with refrigerator, gas cooker and sink.